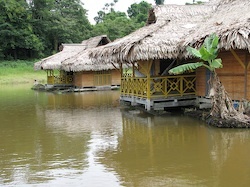 In November 2006, my wife Monica and I spent four nights at the Uakari Floating Lodge in the Mamirauá Sustainable Development Reserve in the Amazon basin in Brazil. This reserve was instituted to protect the White Bald Uakari monkey that lives only within its boundaries, but of course it also protects the entire ecosystem. 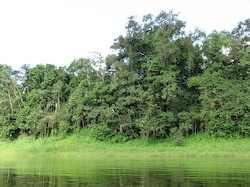 The ecosystem type in Mamirauá is called várzea, or white water flooded forest. In the wet season each year, the water level rises so high that nearly all of the land is flooded. All of the animals and plants that live here have to spend part of the year without relying on dry land.